Yesterday I discussed general principles of value betting. I explored an example with a relatively safe board. No obvious straight draws and only two cards of the same suit so no flush was possible. In many situations when you hold marginal hands against a loose opponent you won’t be so lucky. A scare card appears that may help your opponent outdraw your hand. Many times there will be potential straights or flushes or even a potential straight flush on the board. The board may pair opening up the possibility for a full house or even quads. You may hold an over-pair to the board and now a card bigger than your pair appears potentially making your pair second best. Now you must decide whether or not you have been outdrawn. There are several factors you must consider before you bet out. How many opponents are you facing? What is your position relative to the button? What is your opponent’s likely range of hands from his position? How tight or loose is your opponent? Let’s explore these considerations one at a time. Condition 1: How many opponents are you facing? 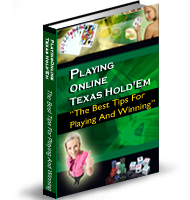 It is a basic rule in Texas Hold’em that the expected value of any playable hand diminishes with each additional opponent. In the case of a multi-player hand, it becomes more likely that a scare card will beat you. Condition 2: What is your position relative to the button? Adding position to the mix is critical. Let’s say you are under the gun holding top pair on the turn. You bet and are called by one opponent. The river is a third spade, a card that completes a possible flush draw. In this case you should bet most of the time. If your opponent has a flush and raises you can go away and not lose any more money but more often than not you will be called with a weaker pair and be paid off. If you are heads-up and in position and hold an over-pair to the board and a card comes that completes a straight and your opponent has been check-calling and now makes a large bet in front of you the correct move would be to fold to a tight player and call a looser opponent. You may be outdrawn but it is likely against a looser player that he is bluffing and your call will scoop the pot. If you are in position in a multi-way pot and a scare card comes that has the potential to outdraw your hand and the board is checked to you then checking is best thereby avoiding a trap. If you are in early position, check as well. There is no reason to stay involved in a hand that may now be better than yours. Condition 3: What is your opponent’s likely range of hands from his position? It is always a mistake to not think about what hands your opponents are calling or raising with. When a scare card comes on the river this condition becomes even more important to your decision making process. Players in early position will generally play a tighter range of hands than players in late position. The exception to this rule is the maniac who plays any two cards from any position but the maniac is usually transparent with his bets as well betting quite small when he actually has a big hand. If you are in early position and a card appears that is an over-card to your otherwise top pair it is correct to make a smallish bet for value, about one-third the pot. The exception to this suggestion is when an ace comes on the river. Your opponent with position may be worried that the big card hit your hand and fold if it didn’t hit his. He may raise if it did allowing you to walk away minimizing your loss. On the other hand, in the same situation, if the over-card also completes a straight or flush, you should most likely check. In this case the scare card is much more likely to complete a drawing hand. It could make a bigger pair, complete a straight or a flush any one of which spells disaster for your hand. Even more scary is when the river puts four to a straight or four to a flush on the board. Unless you hold the top end of a straight-flush, you should probably not bet or call a bet in this situation. The only real exception to this is when the river also pairs the board and you were holding a set on the turn. Let’s say your hand is 8d-8h and the board is 8s-6s-5d-4s. This is a potential for disaster for someone. Let’s say you have two opponents in this hand both likely to be either drawing to a flush or have a made flush already. They may also be drawing to a straight or if they hold a seven have a made straight. If the board pairs, however, you make a full house that beats anything but a straight flush. If the river comes 5s you complete your full house and if either or both of your opponents have a straight or flush you have the potential to scoop a huge pot. I would try to get all my chips in the middle in this case. Condition 4: How tight or loose is your opponent? If your opponents are loose you should be more willing to bet for value than if your remaining opponents are tight. The looser your opponents are the more likely that your value bet will win the pot. Looser opponents are more likely to be holding a wide range of cards, are more likely to be on a bluff and are more likely to be aggressive, defending their marginal hands. A river value bet of around half the pot is warranted against your looser opponents. Tighter opponents have a much smaller range of playable hands and are, therefore, more likely to be playing to strong draws or made hands. Staying involved with tight opponents with a scare card on the river should mostly be avoided. I generally will muck around 80% of the time in this situation but if all I do is muck then I will be bluffed off the best hand 100% of the time, therefore I will call or raise a bet in front of me around 20% of the time. You should generally value bet more against opponents who are unlikely to check-raise when they hold a good hand. Some opponents are afraid to check-raise unless they hold the nuts on the river. Some are too “polite” to check-raise. These opponents are vulnerable to a bluff bet for value on the river unless they hold the nuts and even then I have watched an opponent muck a small straight-flush on the river to a bet around half the size of the pot out of absolute fear that their opponent held a bigger straight-flush. You should bet for value against players who are unlikely to bluff or bluff-raise on the river than those who are. If your opponent checks to you on the river and is unlikely to raise a bet then go ahead and make a bet for value on the river. If called you may lose but you may also watch your opponent throw his hand in the muck. Finally, if the pot is huge a bet for value is always warranted. Your opponents are likely to see such favorable pot odds that they will lower their calling standards in the hopes that you are bluffing. In the case of a larger pot, a bet for value must be big enough to put pressure on your opponents with weaker hands. A bet of from two-thirds the size of the pot to a pot sized bet is generally good enough to induce a call from a player with a marginal hand to call and big enough to chase away any broken draws. Sure, sometimes you will lose with this play but over the long haul you will earn additional profit and gain a significant edge over your adversaries at the table.